My blog about my MSc dissertation. This version of the interface involves using tokens. 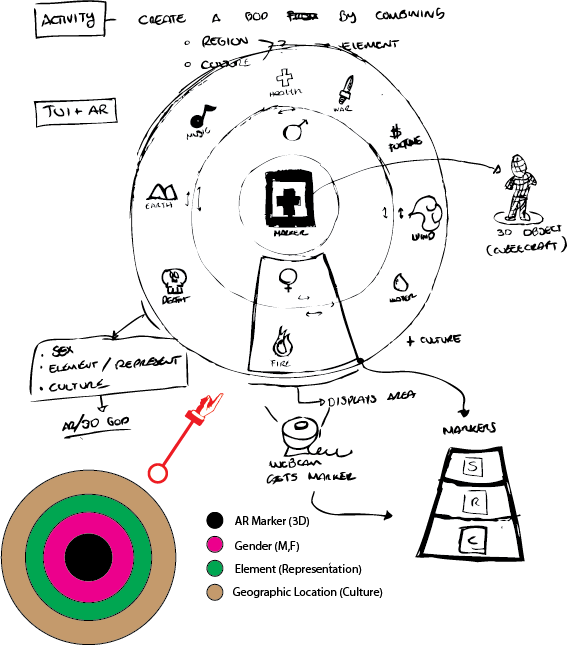 The user can be able to place the token that represents an element or belief over a sensitive area that represents the culture. When area/section and element token are combined, the interface produces the result by representing the deity. This interface I hope to be able to implement it as a table-top version which I hope will produce a more responsive reaction. The visuals are not final but the main concept is very close to what the final output will be. This version of the interface allows the user to explore the various combinations of Element and Culture by utilising a disc. The disc has been build by using paper and by assembling it with glue and a staple. By utilising markers that are visually appealing to the user, the interface may become more engaging. By exploring with a disc, it might bring interesting results to the HCI analysis. This video presents the first test of the God Collector interface. There are two cubes: one representing a specific culture meanwhile the other represents a belief or an element. By combining both cubes, the interface reacts and presents the location of the culture and the iconic representation of that specific God.